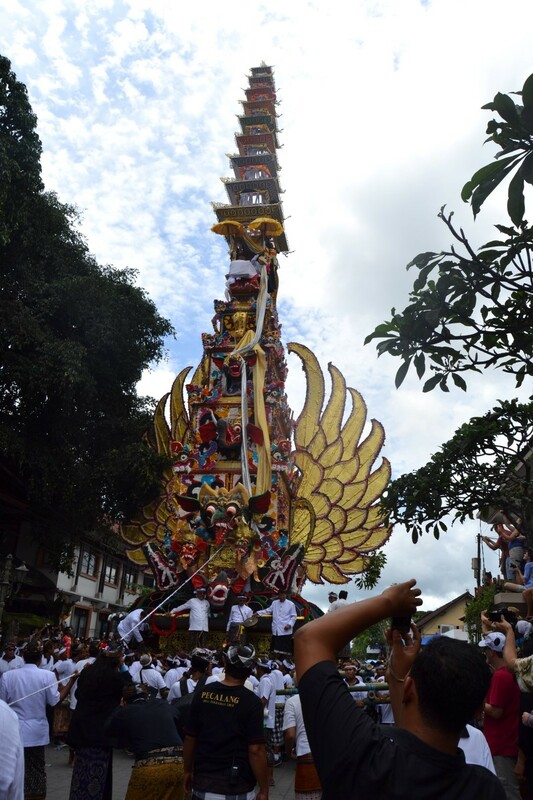 Ubud is considered the cultural epicenter for Bali. It has endless yoga classes, you can find a spiritual guide or Balian, who is what westerners might call a “witch doctor,” or you can just find places to mediate and relax. It has traditional Balinese dancing shows and cremation ceremonies that allow you to see what this special land is all about. We were glad to get a glimpse into this hippie magnet town. Depending upon your arrival time, just spend the next few hours orienting yourself to the town. There are only a few main, long streets with plenty of shops, restaurants and spas to stop at. Depending on how frequent a shopping stop may be, getting a feel for Ubud Bali could take a good amount of time if you want it to. 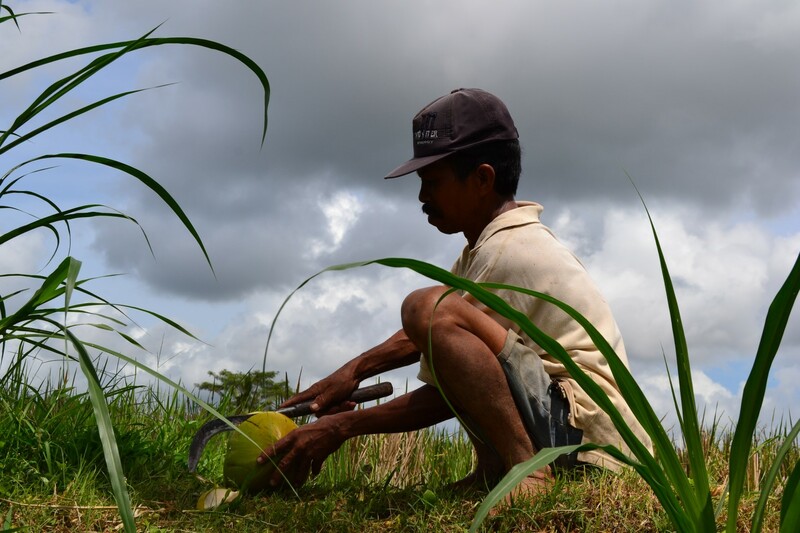 There are no shortages for great rice field walks. 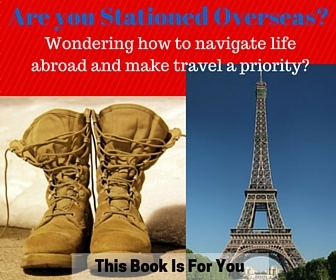 A few google searches and a look in the Lonely Planet Guidebooks and you are sure to find one that suits your needs. 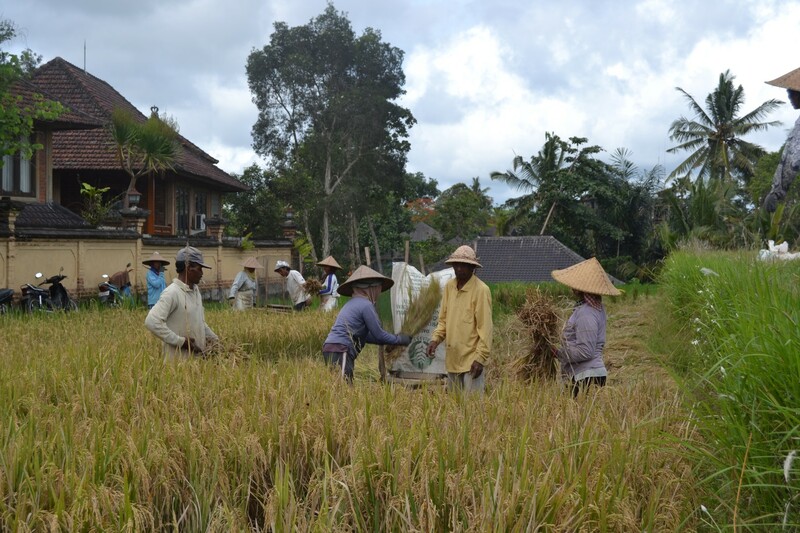 We took one that led straight from Ubud into the fields while passing a few outlying villages along the way. As we dipped in and out of the valleys, it didn’t take long to feel the scorching sun and extreme humidity. When a farmer, who clearly spoke no English saw us, he smiled a toothless grin and pointed to a coconut tree in his field. We asked, “How much?” which he clearly did not understand, smiled again, shrugged and barefooted, shimmied up the tree as if he himself were a little monkey. At the top, using the machete he had been whacking bushes with, he started chopping at a green, ripe coconut. He skidded back down, and using the same knife, opened it and cut off a side piece to make for a faucet-looking device to pour the liquid goodness out from. We laughed and paid him what the going rate for a fresh coconut in town was and he went back to his chores. After the 7-8 kilometer walk, a shower and a nap were in order before taking on the rest of the day. Cremation is a major part of the Hindu culture, as Bali has its own unique twist on the religion, cremations can be a common occurrence and sighting. It just so happened that an important political figure was being cremated that day. A quick stop at the TI office can tell you if any will be happening, but the giant flotation devices ready to be burned were all we needed to let us know about the festivities. It seemed as if the entire town had stopped for the afternoon. Everyone from the town was involved and if you weren’t (aka were a tourist), then you had claimed a section of the sidewalk for the parade. The float holding the body was at least 30 feet tall and required a minimum of 50 men to carry it down the street, occasionally switching out crews. The end destination was a main square in town, next to the cemetery. It was a festive occasion with street vendors selling goods and food with everyone excited to send the deceased into his next reincarnate life. The people of the town made sure that this important figure would get a proper cremation and spared no expense. And then the flame throwers came out. No Joke. It was only a matter of minutes before the elaborate and expensive floats were a mere charred outline of the cows they once resembled. Finally, all the walking for the day called for a foot massage. 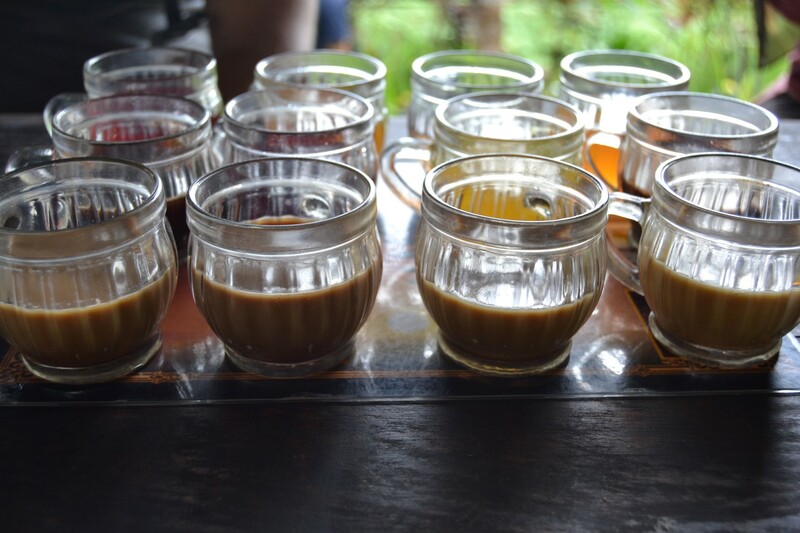 Ubud has no shortages of spas and an hour long foot and leg massage (just the treat after hours of walking) costs less than $5USD and usually includes a tea and sometimes even a snack. It was just the perfect way to end an amazing day. 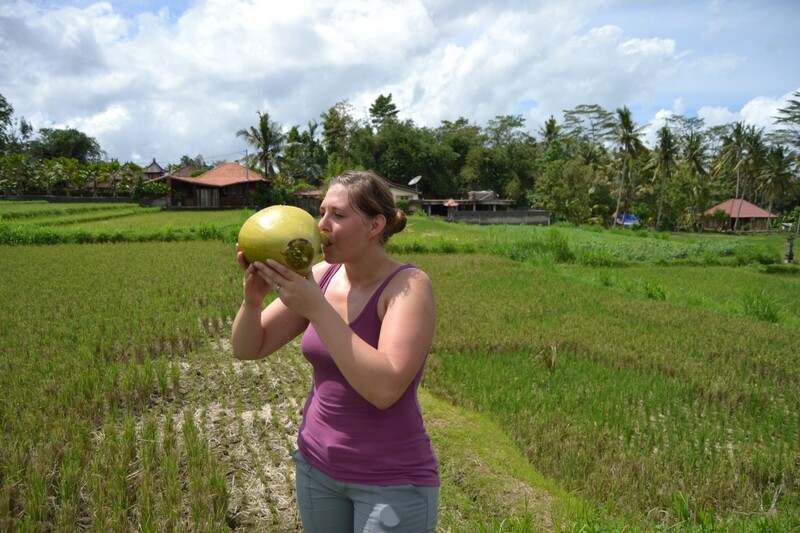 Before arriving in Ubud, I had pre-booked a walking tour with Wayan from Bali Off Course Tours. Wayan spent the morning showing us the local side to life. We started with going to his extended family’s home. 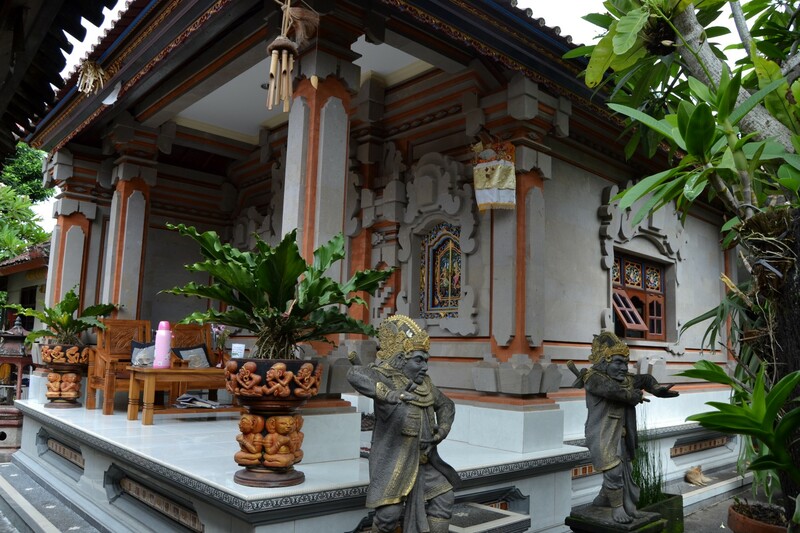 This was a traditional Balinese compound house, housing 9 families inside one walled in area. There was a common cooking area, a “backyard” for planting or animals, a daily temple in addition to their own religious temple plus individual rooms for each family. We got to briefly glimpse into the daily life of the Brahman as well as woman preparing food for the family while the men created elaborate offerings. Next, we walked through more rice fields. Everywhere you look in Bali, you see beautiful fields of shades of greens, yellows and browns; all creating a patchwork quilt of differing crop timings. Everything is done by hand; all the planting, picking and plowing. Seeing neighbors helping neighbors work on the crop that creates the livelihood of most Balians was a humbling experience. Wayan finally took us to his own home where his wife had prepared an elaborate meal of the traditional Nasi Goreng (Balinese fried rice), peanut satay and fresh fruits. After a long morning of exploring, sitting on the open deck overlooking the rice fields with a freshly squeezed watermelon juice, it was easy to see how travelers can fall in love with Bali. The rest of the afternoon can be spent shopping, wandering the streets or getting another massage at any of the various spas. 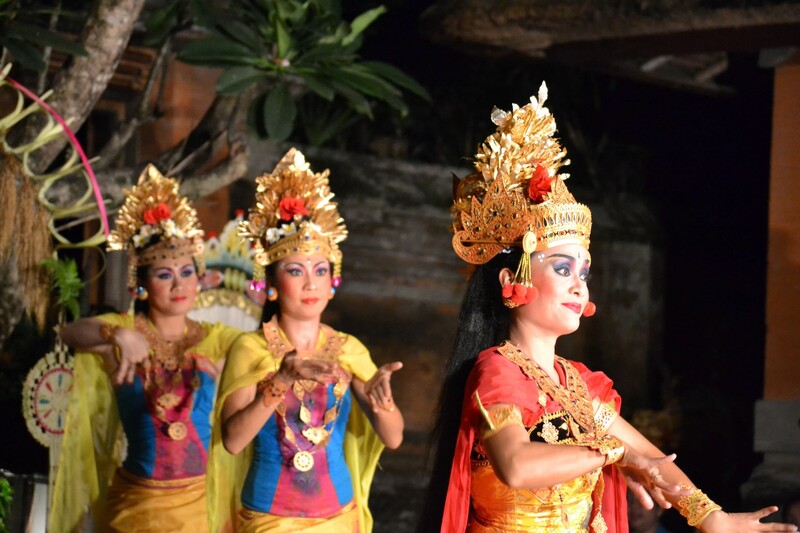 In the evening, enjoy a traditional Balinese Dance. There are shows every night at varying venues. Ubud Bali is where many people go to Eat, Pray and Love. You can get lost in the vibrancy, hospitality and amazing scenery that it may be difficult to pry yourself away. Have you visited Ubud? Were you going for a soul-searching experience or just to see what the beautiful country had to offer? Tell me about it in the comments!